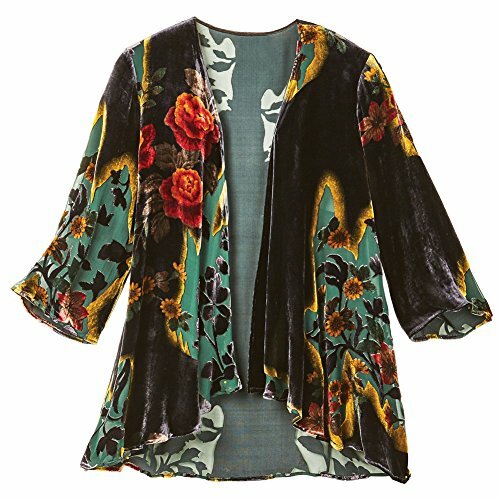 BLACK VELVET FASHION JACKET - Luxurious velvet with an eye-catching print, this fashion jacket gives your daily outfits some floral flair. WEAR WITH SKINNY JEANS OR LEGGINGS - Long, tapered fit looks great over your favorite fashionable legwear. Hangs 31" in the back. SOFT VELEVET - Love the feel and texture of its silk-viscose velvet. Dry-clean. FASHIONABLE 3/4-LENGTH SLEEVES - Keeps you cool in warm weather, and lets you show off your wrists and bracelets. OPEN WATERFALL FRONT - Flowing and dramatic open front adds texture and color to solid-color T-shirts, tanks, or dresses. If you have any questions about this product by CATALOG CLASSICS, contact us by completing and submitting the form below. If you are looking for a specif part number, please include it with your message.